Irish milk production this year is up some 8.4% compared to the same period in 2014, this compares to an EU average increase of 3.1% over the period. The latest EU figures show Ireland way out in front in terms of milk production this year. 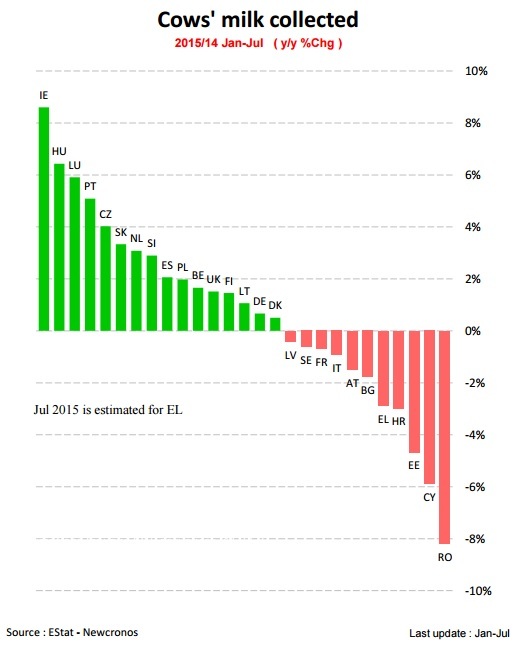 Meanwhile, other Member States such as France and Italy have seen lower production so far this year. 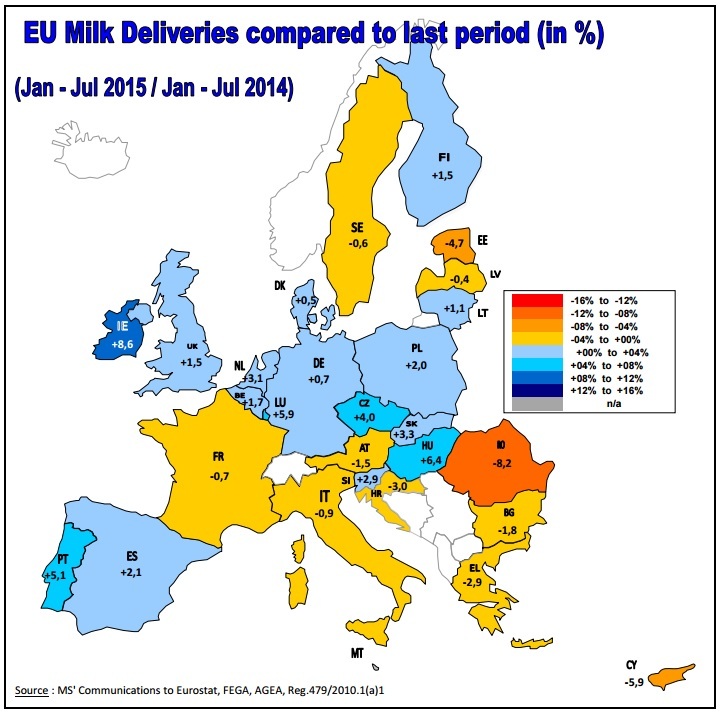 For the short-term outlook, the Milk Market Observatory (MMO) says cumulative EU milk deliveries in 2015 were estimated to increase by 1.1%. Milk production increases continue in Ireland, Hungary, Netherlands, Spain, Poland and the UK, while downward trends are expected in France and Germany. Production would continue to increase in 2016 but by no more than 0.9%. For 2015, increased milk production would translate into 1.3% more cheese (and a stock increase by 30 000 t), 7.5% more SMP (and +25 000 t stocks) and 4% more butter (and + 5 000 t stocks). EU milk production was up by 1.1% in the first seven months of the year, but by 2.8% in the first four months after milk quota expiry. Production increases were registered in 16 MS in the seven month period and in 19 MS in the period April-July. Average farm gate milk prices approximated 29.7 c/kg in July (12% below the last five years’ average) and a further decrease is expected in August (-0.9%). Announcements for the months to come give a mixed picture: some expect further price cuts while others expect stable prices. Organic milk prices continue to offer better returns to producers. At world level, the MMO says milk production increased by some 1.8m tonne in the first half of the year, mainly due to the EU (+ 833,500t) and the US (+ 766,000t). The MMO says there is no sign of production slowdown in the EU but the USDA is revising downwards its world production forecast. It also says that world exports are decreasing, reflecting demand slow down, but EU exports remain dynamic for most dairy products. It says China imports are back to normal levels, i.e. below the 2013-2014 peak volumes but above 2012. However, the MMO also says that concerns remain with regard to possible difficulties in oil producing countries traditionally importing dairy products, given decreasing oil returns. It says sssessing the stock situation in importing countries remains an open question.